Railtown might not be the next Yaletown, but the thin strip of gritty industrial on the lower Downtown Eastside is catching its share of trendy developers. Railtown is north of Alexander Street, south of the rail tracks and bordered by Gore Street to the west and Princess Street to the east. Once known as Japantown, it was first established as a heavy manufacturing zone linked to Vancouver rail and port access. However, a May 2017 City of Vancouver zoning change has increased the area’s density and expanded the industrial definition to include a range of high-tech, creative manufacturing and other light-industrial uses. As in Mount Pleasant, which has similar but less generous density, the zoning change has attracted commercial developers to Railtown. Mount Pleasant is zoned for a floor space ratio (FSR) density of 3 while Railtown has been granted a 5 FSR density, explained Boe Iravani, a real estate broker with Cushman & Wakefield. Railtown developers are also allowed to include light industrial in an entire project; zoning in Mount Pleasant requires that 80% of new space be offices. Land values are lower in Railtown than in Mount Pleasant, and Iravani added that the higher zoning density translates into a less expensive cost per buildable square foot of commercial space. 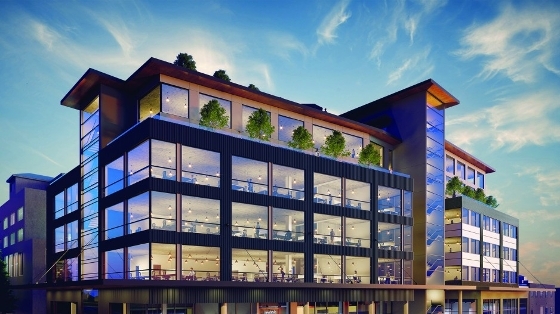 An example is Maker Exchange, the largest of three new projects now underway in Railtown. The five-storey, 152,000-square-foot Omicron and Rendition Developments industrial complex is designed for creative, digital and other light industry. Being built at 488 Railway Street on the site of an old boiler factory, it received city permit approval December 17, subject to conditions. It has some of the largest floor plates (25,000 square feet) of any new commercial building in the city and is the largest industrial project being built in East Vancouver, Iravani said. Maker Exchange is expected to be completed by 2020. New Class A space in Railtown is expected to lease in the $30 to $35 per square foot range, similar to Mount Pleasant or False Creek Flats Class A, but less than the downtown office average, which is north of $45.